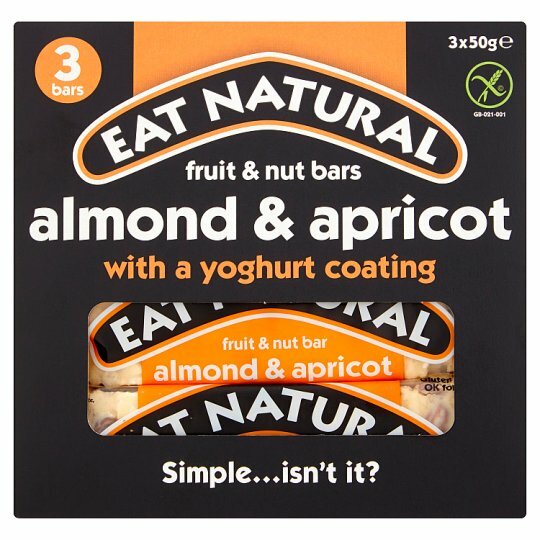 3 bars of nuts and dried fruit with a yoghurt flavour coating. We love almonds at Eat Natural. Ours are specially selected from California for their delicious sweet taste and texture. If that weren't enough, we then roast them gently, for extra flavour and crunchiness, right here at the Eat Natural Makery. At Eat Natural, we prefer dried apricots to taste of... apricots! So unlike the bright orange ones you may be more familiar with, ours don't contain preservatives. They're dried naturally in the sun, giving them their rich, dark colour and authentic caramel sweetness. There's nothing quite like the taste of coconut to conjure up a feeling of tropical indulgence. That's why we've mixed crisp, lightly toasted shreds into this recipe. There's another reason too... coconut is a surprisingly good source of dietary fibre. We're big fans of the humble bee. As far as we're concerned, you'll never match the natural sweetness of real honey. To ensure the very best harvest of rich, clear honey, we work hand-in-hand with a very select group of bee-keepers and small-scale producers. All Eat Natural bars are made with love and cared from simple ingredients, in small batches at our own Makery. Well, clearly it would be wrong of us to claim that everything in this bar is '100% natural' and simply 'grows on trees'. Obviously, some ingredients need to be cleaned, dried and roasted too, and therefore, to some extent, 'processed'. It's just that we believe, the less we mess with it...the better it tastes. That's why we never add any artificial flavours or colours, or any preservatives.